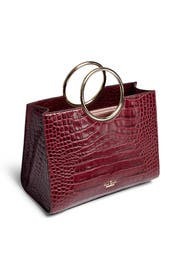 Sleek ring hardware and a faux-croc finish add sophisticated polish to this boxy kate spade new york bag that elevates everything you wear it with. Also available in Black, Primrose, and Pink. 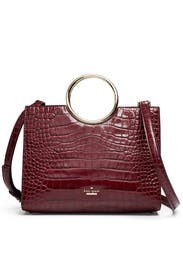 Cherrywood croc embossed leather satchel with ring handles. Zip and slide interior pockets. 3.5" ring handle drop and 20.75" crossbody strap drop. 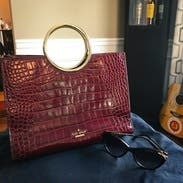 7.75"H x 10.25"L x 5"D.
Love Kate Spade! I received so many compliments! Gorgeous, perfect size for everything needed. Very classy looking. I love the color and the texture. The purse looks expensive and really chic. 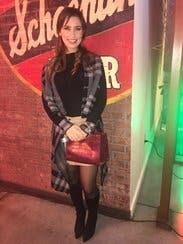 The purse was a gorgeous color for fall and I loved the look of it. The reason for 4 starts is that it was fairly small so you could barely fit anything in it. It was also uncomfortable to hold. Gorgeous color, but smaller than expected and super rigid, making it a pain to use. It fits everything I needed, but awkward to access the stuff. The color and texture leather are perfect fall and winter. The bag is a good mid-size that has two large compartments with a smaller zippered compartment in the middle. It has pretty handles and a long strap. The long strap unexpectedly came off the bag on one side a couple of times because the clasp was loosening but I mainly held the bag by the metal handles. It held everything I needed, wallet, makeup bag, glasses, and keys. A pretty bag that is actually functional too! This worked with dressy and casual outfits, super cute with jeans!